Gimme all the slow cooker recipes! 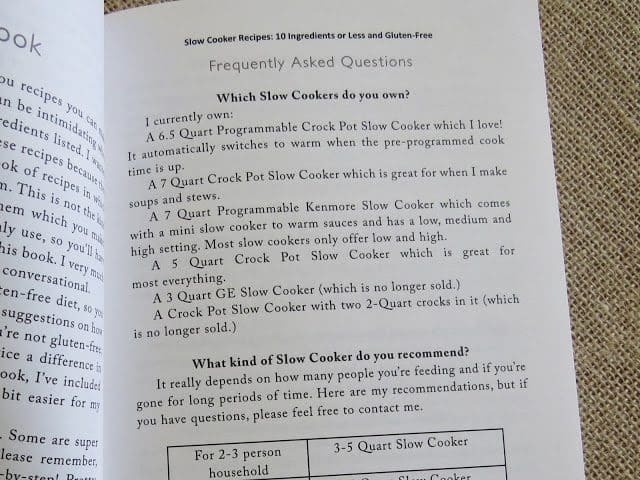 One of the top questions I get here at The Country Cook are for more slow cooker recipes. I happen to love using a slow cooker so I’m always excited when I get my hands on a crazy-good new recipe to make in it! And this next recipe is a winner, winner, chicken dinner! 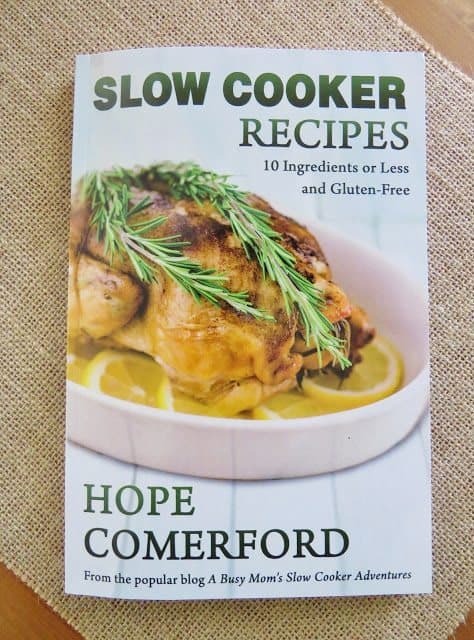 It comes from this cookbook, Slow Cooker Recipes: 10 Ingredients or Less and Gluten-Free by my talented friend Hope Comerford of the popular blog, A Busy Mom’s Slow Cooker Adventures. Yep, every recipe in here has less than 10 ingredients. Hope really wanted this to be a cookbook where you can easily make every single recipe in this cookbook with easy-to-find ingredients and without a lot of fuss! Also, if you are on a gluten free diet but still want great (but still easy) slow cooker meals, this is your cookbook. Hope shows you how to make these recipes using regular, non-gluten free ingredients and also how to make them gluten-free. I do not follow a gluten-free diet but I found all of the recipes to be not only easy, but ones that my family would easily enjoy. 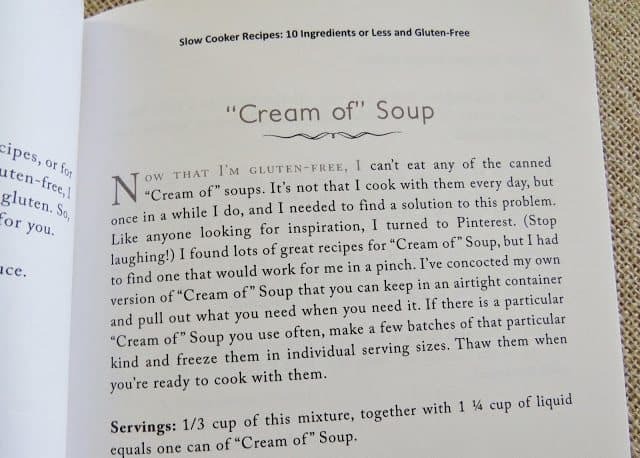 She even shows you how to make your own seasonings and homemade “Cream of” soups! This is really a comprehensive cookbook. Hope give lists of pantry staples that are always good to have on hand. She even talks a lot about the types of slow cookers that are out there and what would be suitable for you to own. 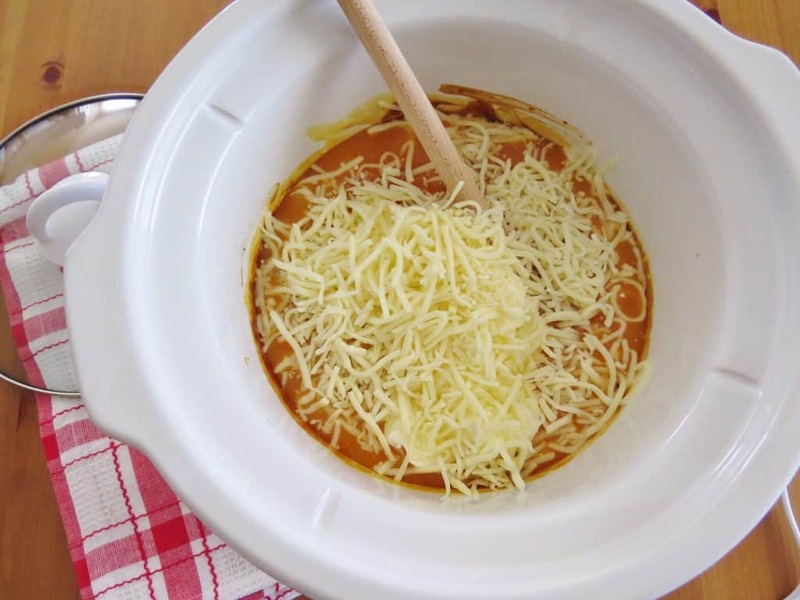 She also gives tips on how to get the most out of your slow cooker as well as answering questions she is frequently asked on her blog. 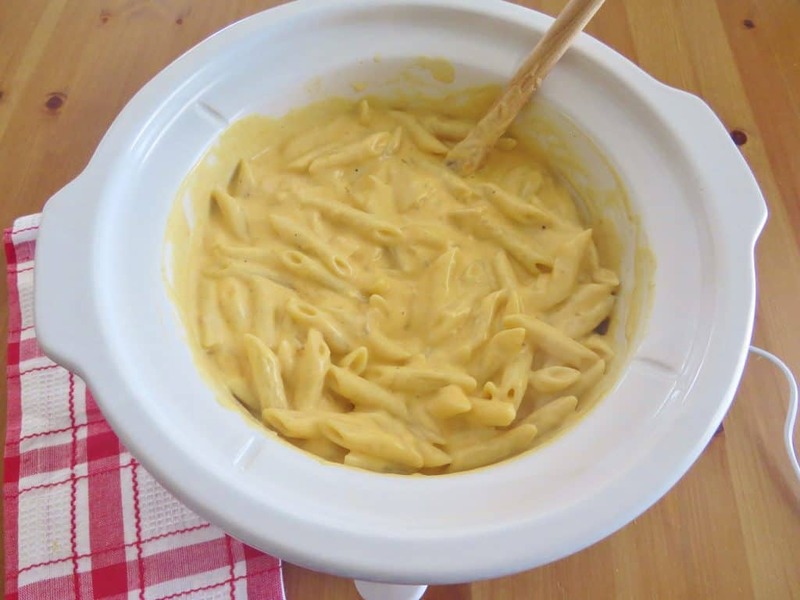 There’s even a slow cooker Mac n’ Cheese recipe in here! I can’t wait to try that one! Every single recipe (there are 38) in here has a photo included (except for the seasoning recipes)! What I really enjoyed too about this cookbook is Hope writes and gives directions as if she were right in your kitchen with you. She is expressive and real and you can really hear her voice in this entire cookbook. 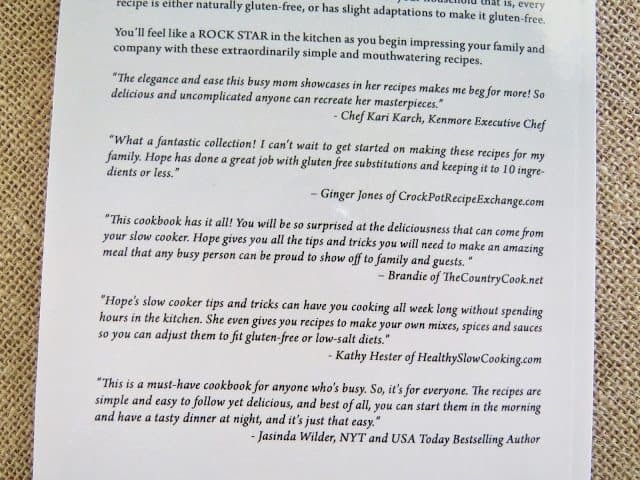 And you might recognize a name or two on the back cover of her cookbook. 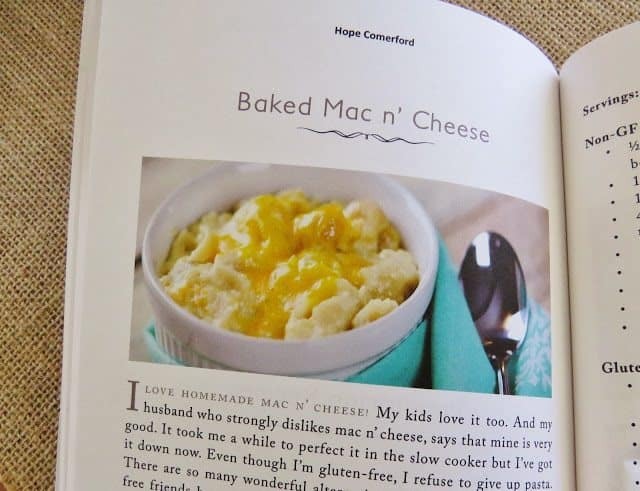 Folks in the slow cooker community are really loving Hope’s debut cookbook. Special thank you to Hope for allowing me to share one of her recipes today. I really wish my photos did the taste of this meal justice. 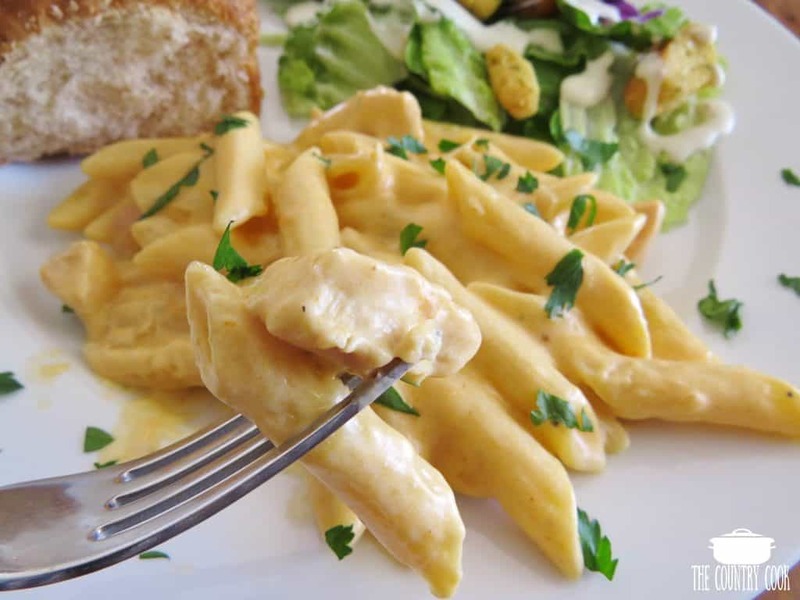 Seriously, the flavor in this Buffalo Chicken Pasta was absolutely amazing! I was worried it would be too spicy. With my acid reflux these days, anything spicy sets off my body’s internal fire alarms. But it was hardly spicy at all. It had just a light kick. Now, if you wanted that super spice, you could use a hotter sauce than I did. the chicken comes out so tender and the sauce is so creamy and it is a whole meal in one. The leftovers reheated wonderfully the next day too. Make this – you will not be disappointed! 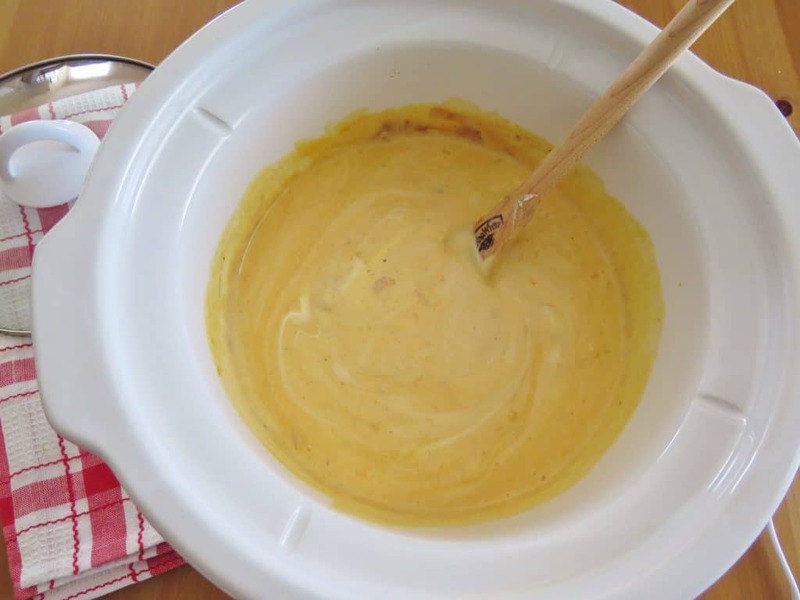 In a 5 quart (or larger) slow cooker, mix the cream of chicken soup, buffalo wing sauce and red onion. Note: Some folks like to use the new slow cooker liners. I don’t usually use those. I just spray the inside of my crock pot with a little nonstick spray and it always cleans up beautifully. Plus, the liners make it a little hard for me to get clear photos. But use whatever you enjoy to make it easy on you! Season your chicken chunks with salt and garlic powder (I sprinkled a bit of pepper on there too). Add the chicken to the sauce and stir well. Cover and cook on low for 7-8 hours or on high for 3-4 hours (until chicken is thoroughly cooked). Note: About a half hour before serving, start the water for your pasta. While you’re waiting for the water to boil, turn your slow cooker to low (if it isn’t there already). Add in sour cream and ranch dressing. 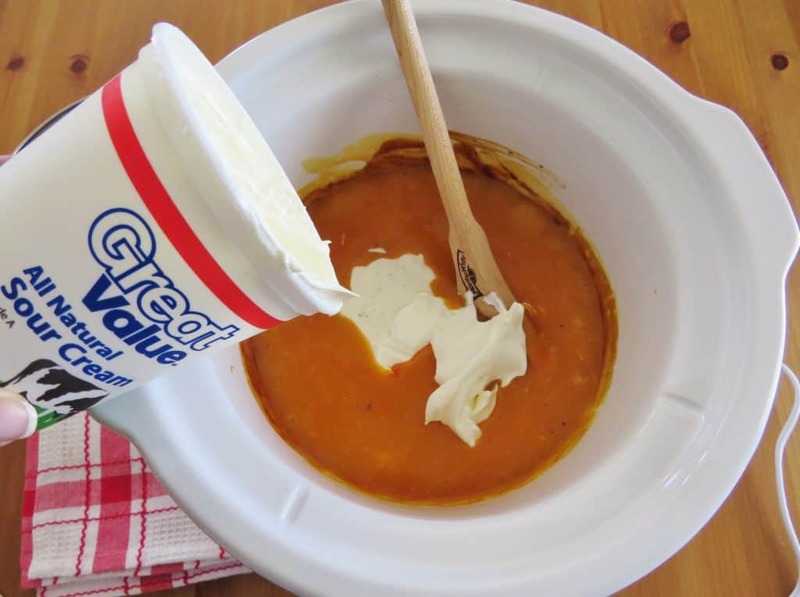 This will cool down the spicy flavors a bit and really add incredible creaminess! Stir until well-mixed. It tastes amazing at this point! 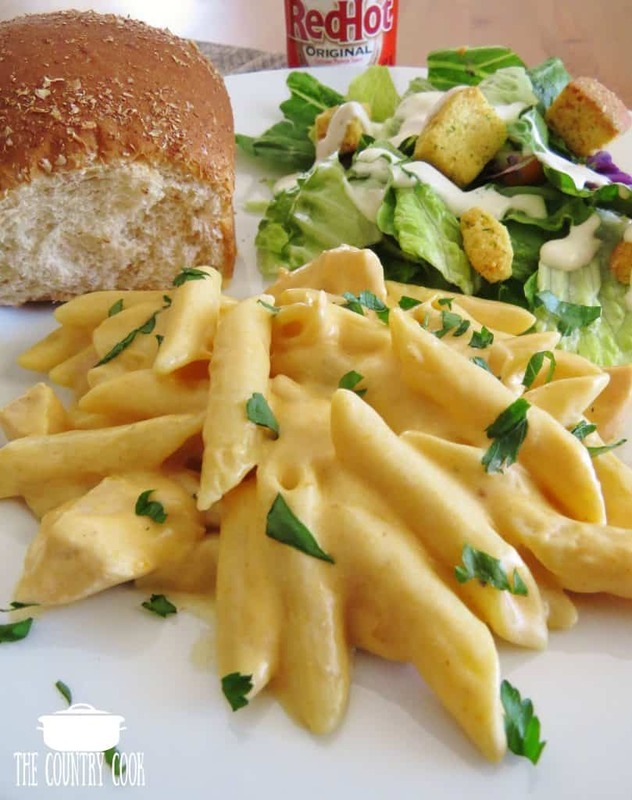 When noodles are cooked and well-drained, add them to the buffalo chicken mixture in your slow cooker. Note: I sprinkled some fresh, chopped parsley on mine. It is not necessary to the flavor of this dish. I just like to add a bit of green to pasta dishes cause I think it looks pretty. But don’t go out and buy parsley just for this dish. 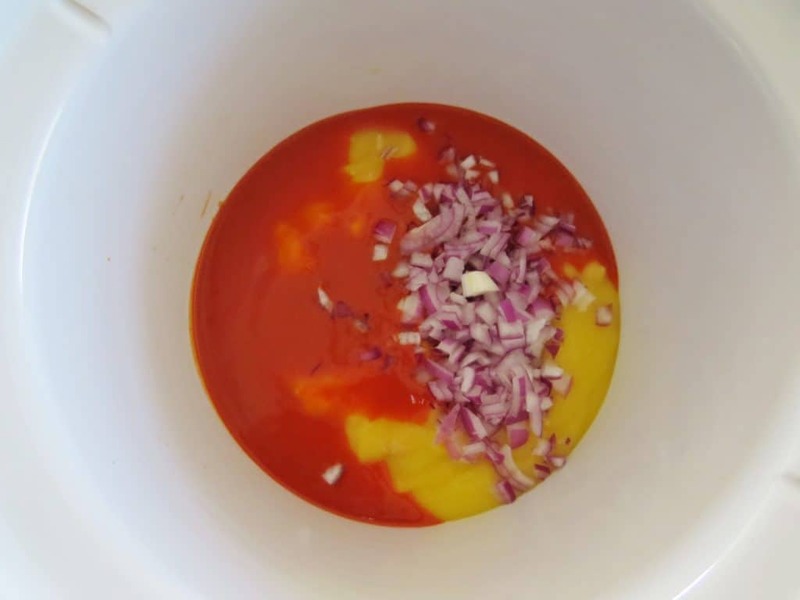 In a 5 quart (or larger) slow cooker, mix the cream of chicken soup, buffalo wing sauce and red onion. 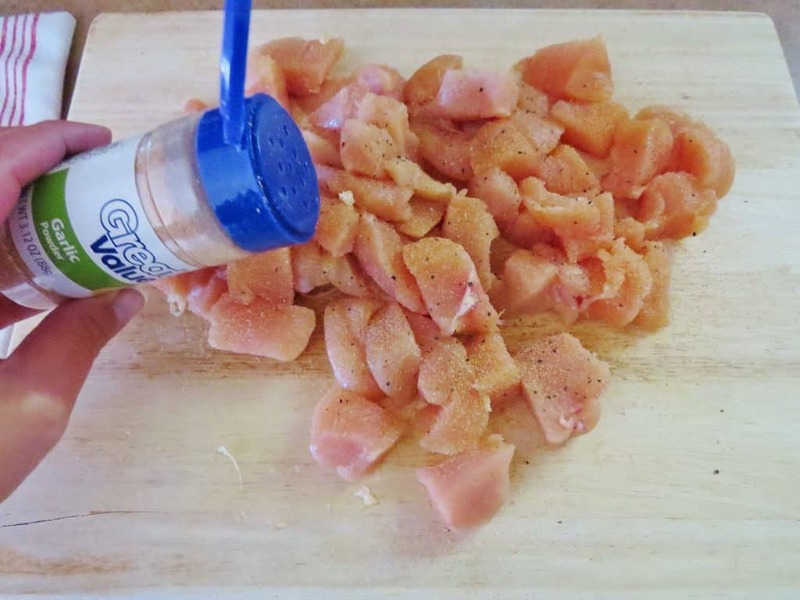 Season chicken chunks with salt, pepper (optional) and garlic powder. 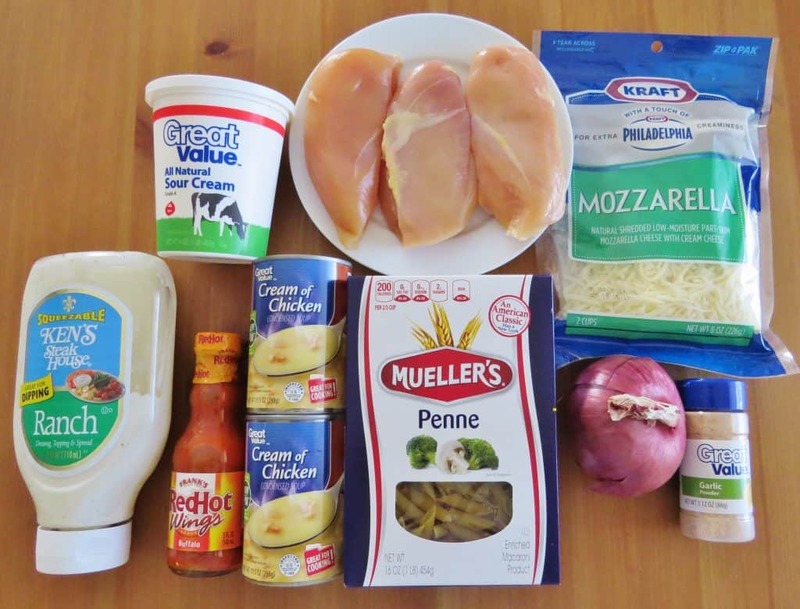 Add cooked noodles to the buffalo chicken mixture in your slow cooker. 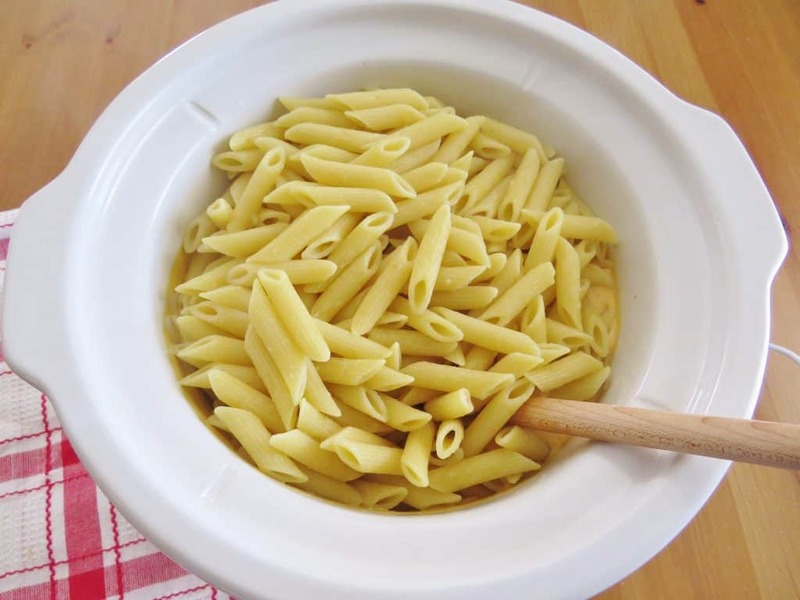 About a half hour before serving, start the water for your pasta. While you're waiting for the water to boil, turn your slow cooker to low (if it isn't there already). LOVE your site!!! I pinned this recipe to my FOOD Pinterest board! I pinned this recipe to Pintrest!! I use my crockpot often! I have gone thru two. Every Friday we attend music at one of two places. Looking for new recipes to take. Soups, different chilis and vegies are great but trully need new ideas. looking forward to trying Buffalo Chicken Pasta!! This was a great recipe! 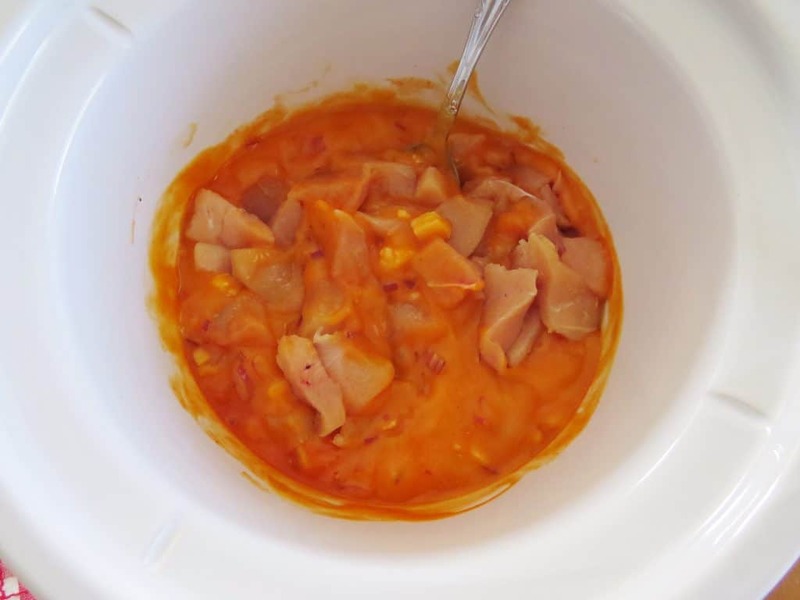 I am intrigued by Hope's imagination and creativity and would love to try her other recipes! I'm a disabled mother of two so it's hard for me to spend a lot of time in the kitchen cooking. Crock pots are amazing because I can go in there and throw it all together, turn it on and dinner is done!! Would love this cookbook to widen my recipe selection to keep my 7 and 8 year old daughters interested in dinnertime! Pinned this to my recipe board! I would love some great ideas for week day meals. Thanks for the chance to enter. 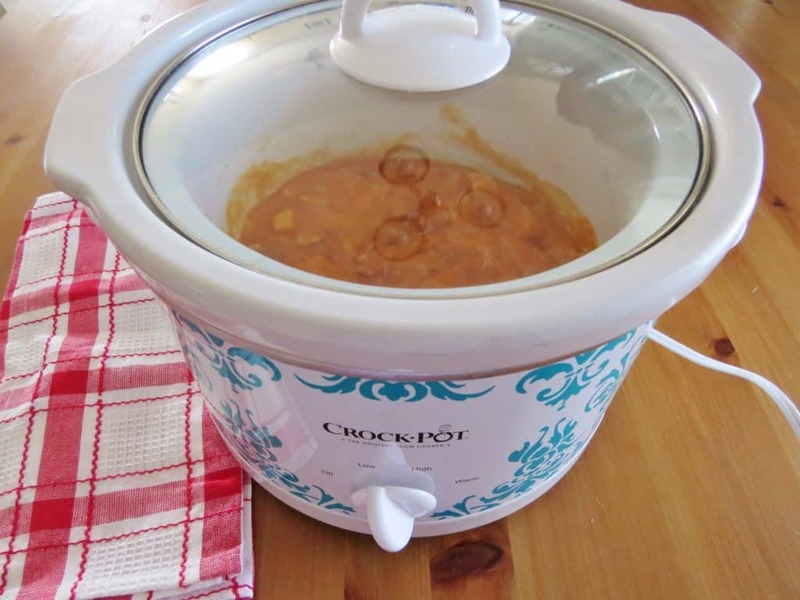 I pinned your recipe to my crockpot recipes. Thanks for the chance to enter. 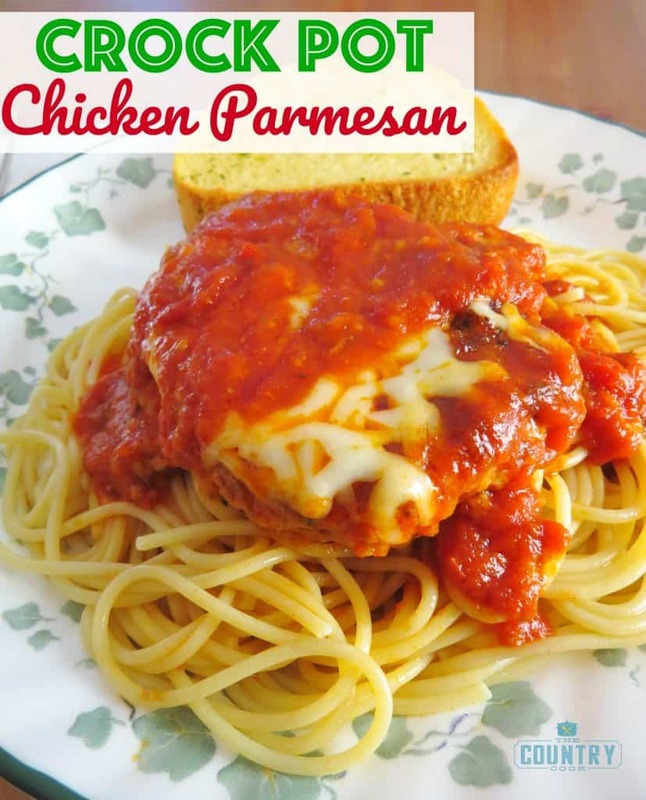 I was on your blog looking at the meatball recipe when I cam e across this one. Thanks so much for the great ideas. I also pinned this ( and the meatball one) to my crock pot board. 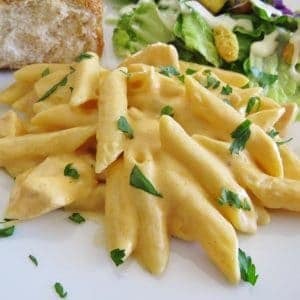 I just found this recipe for the Buffalo Chicken Pasta and can not wait to try it for myself and my elderly mother.She is 90 years young and she has the appetite of a man.We eat a lot of chicken ,so I am always looking for new ways to fix it.Will let you know what we think about this recipe.Although I can say now it will probably be very good.I would love to have this cook book to add to my precious collection of recipes and books.Love this site.Thanks for all your hard work. 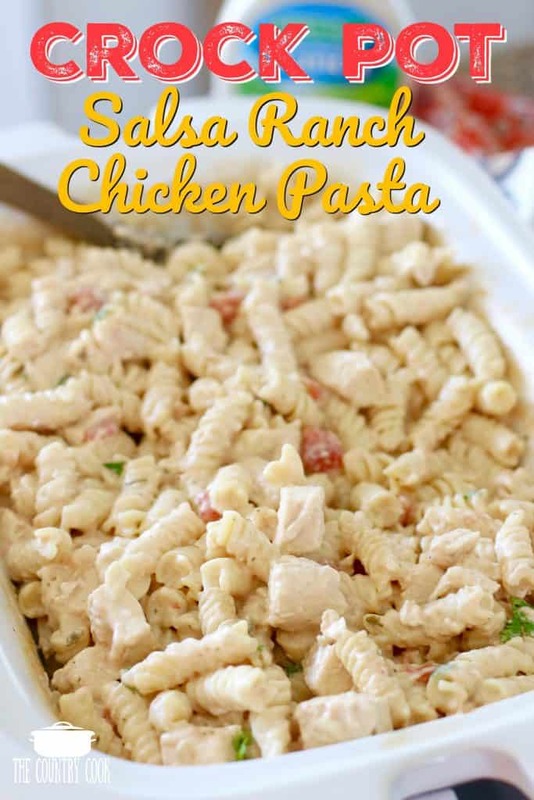 I pinned this recipe to my pinterest site and I also placed in in my ziplist account.I use both.I hope I get a copy of this cook book.Thank you greatly for all your hard work again.GOING TO LOOK FOR MORE OF YOUR GREAT RECIPES. !! I'd like to win this and give the copy to my friend. She just started doing a gluten free diet for her family about 2 weeks ago! Looks delicious! kbell47554 @ aol . com Kimberly B.